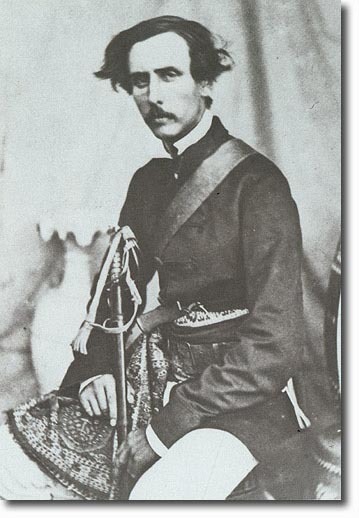 This photo by Felice Beato, taken during or soon after the Indian Mutiny, shows a gaunt Lieutenant Mecham of Hodson's Horse in his early thirties. He can also be seen in British and Native Officers 1858 wearing the same uniform. The jacket is probably dark blue with black cord frogging. His kummerbund is red. Mecham was born on 24th Sept 1831, the son of Capt George Mecham of the 3rd Dragoon Guards and his wife Harriett. His baptism is recorded in the parish register of Melcombe Regis, Dorset, 21st Feb 1832 but his parents later moved to St Helier in Jersey. He was educated at Cheltenham College from April 1845 to June 1847. After that he had private tuition in Jersey where he met Sidney Jones-Parry who he was to meet again in India. Jones-Parry wrote his memoires in later life and mentions Mecham several times. 12th Dec 1849 Posted to 27th Madras NI at Trichinopoly. 12th Feb 1856 Appointed Adjutant of Infantry, Oudh Irregular Force. 25th July 1856 Acting Second in Command 7th Oudh Irregular Infantry. 23rd Nov 1856 Promoted to Lieutenant. 12th Oct 1858 2nd in Command of 3rd Regiment HH. Mecham only served a few days under Hodson before the latter's death. The new Commandant of Hodson's Horse, Henry Daly, made him adjutant. He was badly wounded at the battle at Nawabganj along with Lieut. Fraser and two Indian officers. On an earlier occasion, on 17th Feb 1858, he injured his back when he fell from a tree. When he took command of the 9th Regiment he joined them at Cawnpore and then moved with the regiment to Peshawar. The record states that he was removed from the command of the regiment but does not say why. He appears to have been unemployed between Sept 1864 and April 1865 when he did general duty at Ambala. His illness and imminent death gave him time, on 3rd August 1865, to make a will leaving his money to his two brothers and two sisters.